Ever since we moved to Spain 3 years ago, my children have been enraptured by the ‘divers’. We see them on their boats and walking along the beaches, sweltering hot in their black suits and weighed down with their heavy tanks. If we’re really lucky we see them jump in and disappear into the crystal clear waters. Or sometimes they arrive out of nowhere, heralded by a burst of bubbles from below. Galen got a snorkel set for his 3rd birthday. He’d sit on the beach wearing it, the fins too big, the mask hanging off his nose, his pink toy golf caddy by his side starring out at the diving boats. In his mind at least he was one of them. As we know, swimming is a great way to keep cool in the heat. The time has come to actually learn to snorkel. They feel ready. 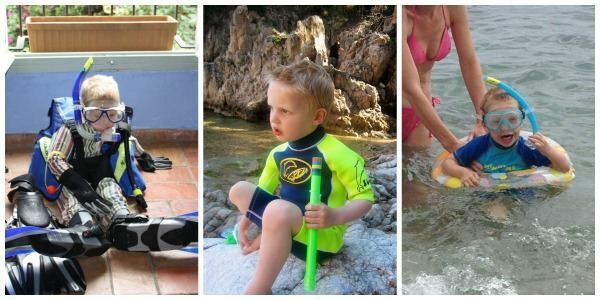 Galen, nearly 6 can swim unaided and Dante, just 4, can swim although not strongly. He has no fear and will happily but his head underwater. Before you start. Confidence and safety. 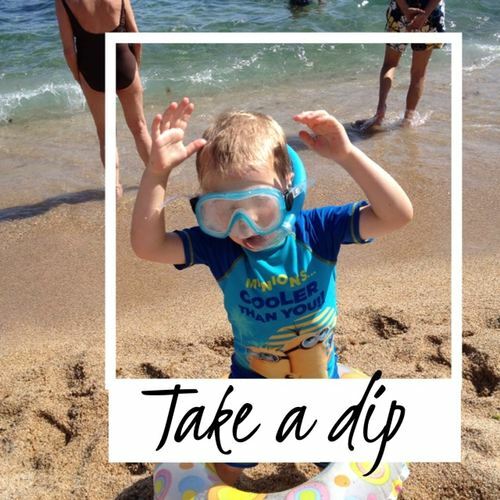 Are your children confident in the water? If they aren’t happy putting their head under water, it’s probably best to wait until they are. Although my children are relatively young, I’ve waited for a couple of years to teach them properly as they didn’t really feel ready before. It’s important to think about safety too. We go to beaches with no current and practically no waves where the water is crystal clear. The children are only allowed out of their depth when they have an adult with them. Even if we’re not actually in the water with them, we’re watching them closely from near by. It’s important not to underestimate the dangers of water, at the beach or in your back garden. Let’s start snorkelling. Get a good mask. We started in the garden. We have a large paddling pool that they can swim in (think large hamster wheel). (It was a great buy, you can get it delivered from amazon UK or amazon US (affiliates)). We started by getting to know our masks. A mask should fit your face nicely. Wipe away bits of hair and squash the mask against your nose and eyes. As long as you don’t breath out of your nose, it should stay there. If so, you’ve got a good seal and a properly fitting mask. Clean your mask. A little bit of spit, rub it around the inside of the mask and then rinse it out. (I know, a bit gross but pales into insignificance after 6 years of nappies.) It should stop your mask from steaming up. That’s the way all self respecting divers do it! Put mask on and snorkel in place. We’re away. We started by just putting our faces under the water to see what it was like and to see if the masks leaked at all. Next step, clearing your mask if it does leak. How to clear your mask. Place finger on top of mask. Blow out of your nose. The water should drain away. You can do this under water or on top of water. We practiced this a bit. And the importance of not getting the end of your snorkel under water. Hmmm, we did that a few times! Ready for the open sea. Galen in his eagerness would like to take his fins with him. I think it’s too complicated so we leave them at home. Both of them had their rubber rings to start with. The water is beautiful, blue luminescence. I love the Mediterranean. We get in and practice putting our head under for a moment. Galen sees a big fish and is really excited. We splash around, enjoying looking under the water. After a bit, Galen gets cold and goes in. Dante is more resilient and although he’s only 4 he’s keen to keep going. 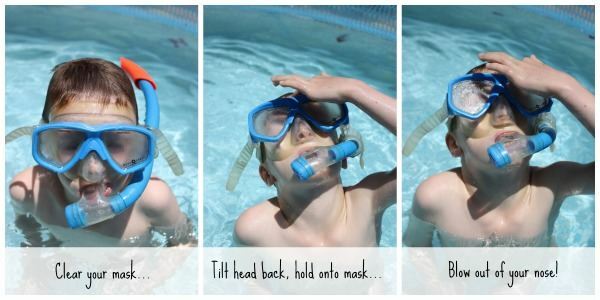 He’s happy to put his head under although he hasn’t quite got the hang of breathing through the snorkel. He’s really excited to see ‘an enormous fish’…and lots of seaweed. We’ve practised a bit more and both of them are really happy in the water. They can both put their heads under and breath through their snorkels. It’s great! Now I get to go snorkelling without feeling guilty for leaving my husband on the shore with all the kids. Better start saving up to go to the Maldives! 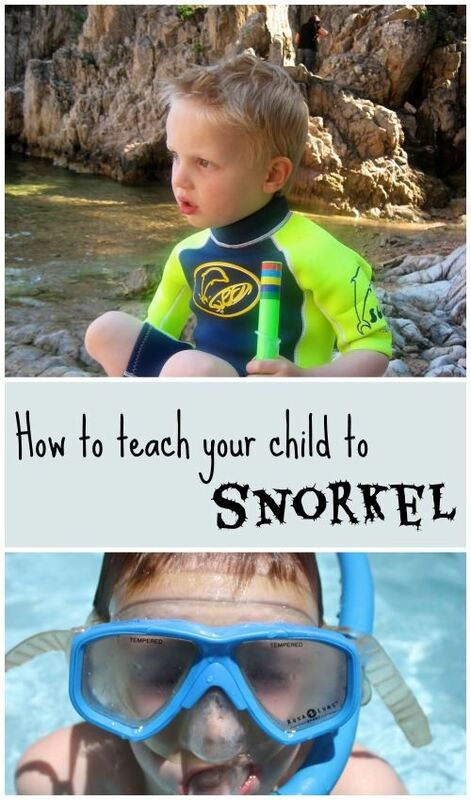 Follow Orlena Kerek at Snotty Noses's board Summer fun on Pinterest.